In our special edition of AnimaList, we present the annual review of our activities and achievements in 2017. 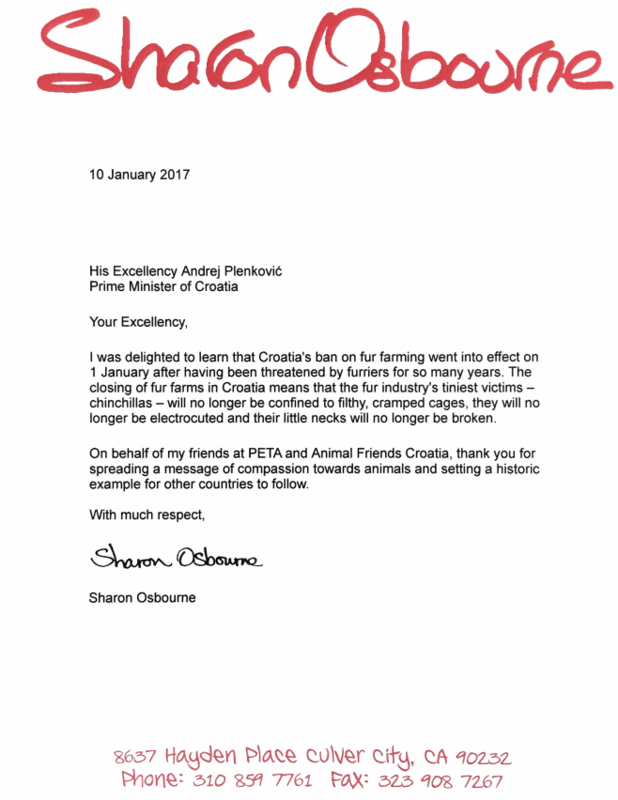 The Croatian ban on fur farming, which was introduced in the 2006 Animal Protection Act, has become effective as of January 1, 2017. This ban is a product of a laborious battle fought by Croatian citizens, institutions, and organizations throughout a long 10-year phase-out period. Croatian Minister of Agriculture Tomislav Tolušić received a thank-you cake from our organization, as well as a thank-you letter from Sharon Osbourne! An investigation carried out by Animals International and TSB|AWF revealed shocking truths about the horrific conditions and cruelty suffered by animals exported from the European Union. United behind the campaign #StopTheTrucks, these organizations joined forces with us and other members of the Eurogroup for Animals in order to submit a request for a ban on the transport of live animals to the European Commission. 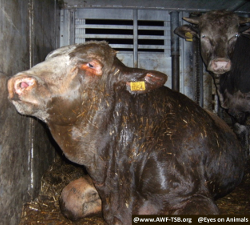 More than a million signatures to stop the transport of animals for slaughter is collected in Europe. In collaboration with Animals International, we are offering a more sustainable and effective solution to the issue of transport cruelty. Find out more at WhyVeg.com/en. On Meatout, celebrated around the world on the first day of spring, we collaborated with pizzerias and encouraged them to introduce vegan pizza into their menus. 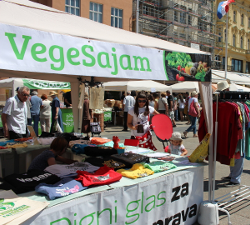 We also organized an event in Ban Jelačić Square in Zagreb, where tasty, healthy pizzas, made without animal products, attracted the interest of many hungry visitors. 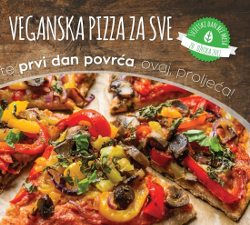 Vegan pizzas are now available in pizzerias in Zagreb, Split, and Osijek. 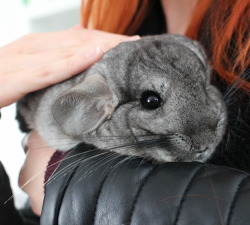 45 Chinchillas have been Saved! With the help of the Mrkvica Organization, our carefully executed action saved the lives of 45 chinchillas! After the Croatian ban on fur farming, which was introduced on January 1, some fur farmers responded to our appeal to put the animals into a shelter. The saved chinchillas whose faith was death because of their fur will spend now their lives in their home sin Zagreb, Split, Rijeka and other towns. We invite you to watch the photos and the video about chinchillas rescued from fur farming (a practice banned in Croatia since January 1, 2017) and adopted in Croatian family homes. 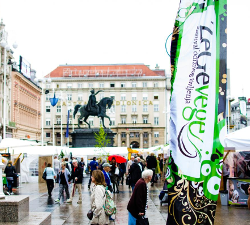 As an overture to the upcoming ZeGeVege festival taking place in September, we held the 6th VeggieFair, featuring over 15 manufacturers of vegan foods and cruelty-free cosmetics. Croatian theatre director Igor Barberić also gave his support to the fair. In collaboration with Croatian model Zvoncica Vuckovic and as part of our “Family to the beach, dog to the streets?” campaign, we reminded on the mandatory microchipping and a fine of up to 6,000 kunas for those who fail to comply with this legal regulation. 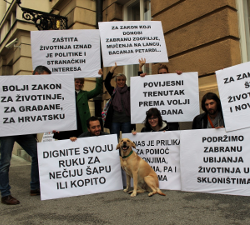 On the posters, Zvončica was joined by Abbo and Lady Di, two dogs from the Dumovec Animal Shelter. We also sent letters to all local communities, attaching leaflets with information about the guardians’ legal obligations, so that they may be distributed to all the households in that area. After a years-long campaign against the use of festive firecrackers, we were finally able to make some progress! The new Act on Explosive Substances and Production and Traffic of Firearms will include a ban on the supply and use of category F3 firecrackers and bandoleers, as well as the use of pyrotechnic articles of categories F4, P1, P2, T1, and T2 for personal purposes. The use of pyrotechnic articles of categories F2, F3, T1, and P1 is banned in indoor areas and gathering places destined for large groups of people. It is also illegal for persons under the age of 18 to buy and use pyrotechnic articles of categories F2 and F3. These amendments are just the first steps towards our goal, which is a permanent, year-round ban on the supply and use of pyrotechnic articles of categories F2 and F3. Everyone at the 10th ZeGeVege Festival! On September 8th and 9th, we held the 10th ZeGeVege Festival! Countless visitors not only enjoyed the lovely weather in a relaxed and positive environment, but they also got to taste many vegan foods and freshly-prepared meals. Additionally, visitors were offered roughly 20 different presentations and culinary workshops, as well as performances by various Croatian and foreign dance groups! Visit our Facebook page, zegevege.com and our website for photos. We also invite you to take a look at a video filmed by Marin Rendic. 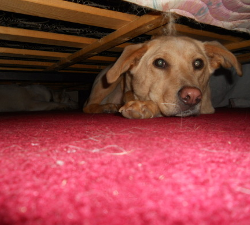 The New Animal Protection Act is Enforced! After 15 long years of our effort and the big animal protection associations and citizen engagement, the new Animal Protection Act was adopted in the Croatian Parliament on World Animal Day, and its implementation began on October 26th, 2017. During the parliamentary session we were in front of the Parliament with the banners. The new Animal Protection Act contains many positive changes and regulates the time framework for implementation. It also prescribes higher penalties and fines for neglectful citizens and other responsible instances, whether they are individual or communal, such as cities, municipalities and districts. Regarding its the implementation, we held numerous meetings with representatives of the Croatian Ministry of Agriculture, communal inspectors and representatives of local authorities. 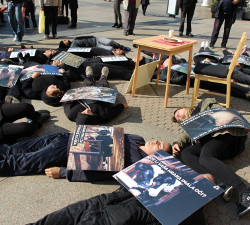 On the World Day for Farmed Animals, we held a performance in which 20 activists were lying on the ground to demonstrate the “invisible” status of animals in our society. They had pictures of farmed animals, showing passers-by how meat, milk and eggs come to our tables, and why slaughterhouses and farms are hidden from people’s eyes. Look for the photographs here. 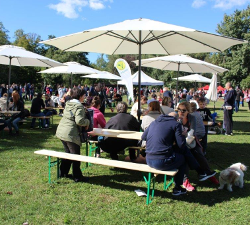 In cooperation with the city of Zagreb, we celebrated this year’s World Animal Day at Bundek Lake with a successful Veggie picnic, in which everybody enjoyed vegan food and learned about new ways to help animals. 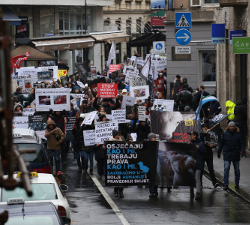 On the occasion of International Animal Rights Day (December 9th), nearly 400 two and four-legged participants marched loudly through the center of cold and rainy Zagreb! The March was supported by Dunja Vejzović, Ibrica Jusić, Igor Barberić, and many other celebs who sent messages of support, as well as 17 associations from Croatia and 12 associations and political parties from around the world. Watch photos and videos from the March and experience the great atmosphere. – On the occasion of International Feral Cat Spay Day, veterinary clinics which responded to our appeal castrated up to two street cats at their own cost. Throughout the entire year, in cooperation with veterinarians, we offer the possibility of spaying/neutering dogs and cats at affordable prices or free of charge. – We have sent a letter to all local communities on the possibility of prescribing permanent spaying/neutering as a mandatory way of controlling reproduction and solving problems with abandoned dogs in their community. – Organized by the Animal Protection Network at the Shelter for Abandoned Animals of the City of Zagreb in Dumovec, the first meeting of the shelters was held, which covered various topics related to shelters, animal adoption programs, and the drafting of the Rulebook on shelters. Representatives from more than 20 shelters were present at the meeting. – Following our official letter and comments during the public debate on the proposal of the Regulation on Municipal Waste, the Croatian Ministry of Environment and Energy decided to remove a provision that included pets in the price of waste collection. – Worried for the welfare of horses in competitions in pulling logs which take place in some parts of Croatia, with support of the veterinary inspectors and the public we will keep demanding their complete and strict legal ban. Thank you all for your support, for following us, and participating in our activities. Stay with us this year too, support us through membership, donations, or in any way you can so as we can achieve many new successes together. Follow us on social network: Twitter, Facebook, LinkedIn, Instagram and YouTube.